Last week Benzo and I stopped into our favorite used book store while we were out and about. We like to stop by about once a week or so to see if there’s anything new. Used book stores are great because the stock turns over quickly so there are always new books on the shelves. I like to keep an eye out for certain books. Veganomicon for only $10!!!! And it even still had the full price sticker from Borders on the back! I checked out Veganomicon from the library last spring and I liked it so much I renewed it 3 times and kept it nine weeks! I kept debating whether to buy it or not. I looked at it on Amazon and then at Borders but could never bring myself to pay full price. But when I saw it on the shelf at Half Price Books for $9.98 I snatched it off the shelf faster than you can say “vegan”. 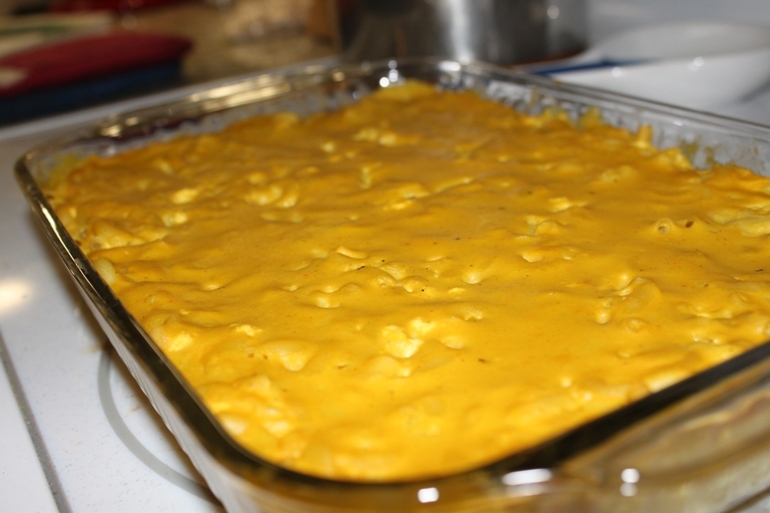 I celebrated my amazing find by making a recipe that I wanted to make before but never got a chance to – Mac Daddy. Basically dairy-free mac and “cheese”. If you remember I try not to eat too much dairy because it gives me sinus problems. The recipe wasn’t too complicated, though it did take about an hour to pull it together. And it turned out really tasty. When making vegan version of non-vegan food, always go into it with an open mind and never, ever expect that it will taste exactly like the original. You will be surely disappointed. With that in mind, Mac Daddy doesn’t taste like dairy mac and cheese. But it is very good in its own way. Creamy and somewhat cheezy. 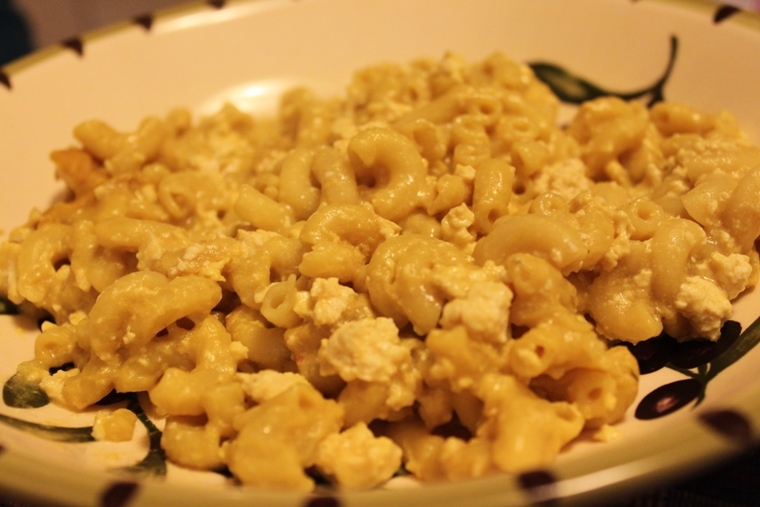 If you have Veganomicon, have you ever made Mac Daddy before? Or any other homemade mac & cheeze (or cheese)? Can you email this recipe to me? (I won’t ask you to post it b/c of copyrights) I’m not eating much dairy because it makes for a sad, hurting baby. I know I’ll incorporate it back in, but for now I’m taking it easy on the cheese, though I LOVE mac n cheese!! I don’t know what happened, but the first time I posted this, the pictures of the mac daddy didn’t show up! So I’ve revised and reposted and hopefully you can see the pictures now. Yummy! Did you get that at Half Priced Books? I love that store. I haven’t made that but I love vegan recipes, not because they taste like the ‘real’ thing but because they taste GOOD and make me feel good! Being a vegan isn’t about making recipes to see if you can find a taste like meat or cheese. At least that’s how I feel! This is a really delayed question… what type of tofu did you use? In Japan we have the thicker, chunky textured “momendofu” (no idea the name in English) and the silkier textured tofu (not sure the name of it in English or Japanese). I’ve substituted the silkier stuff into cheesecake recipes (refrigerator kind) and it’s been awesome. If you can get ahold of that you probably would get a nicer texture. Just a thought!